In 3 weeks there have been 3 different #1 teams in Division 1. This week Central Virginia bounced back with a solid victory in interstate play and made a significant statement. They edged off previous #1, Tulsa NOAH, who slipped to #2. Lighthouse of Springfield stayed at #3, while Noblesville Lions scooted into #4. Anderson, stinging from a tough week, dropped 3 spots, all the way to 5th. The rest of the top 10 stayed somewhat stationary, while some very huge reordering happened throughout the rest of the charts. 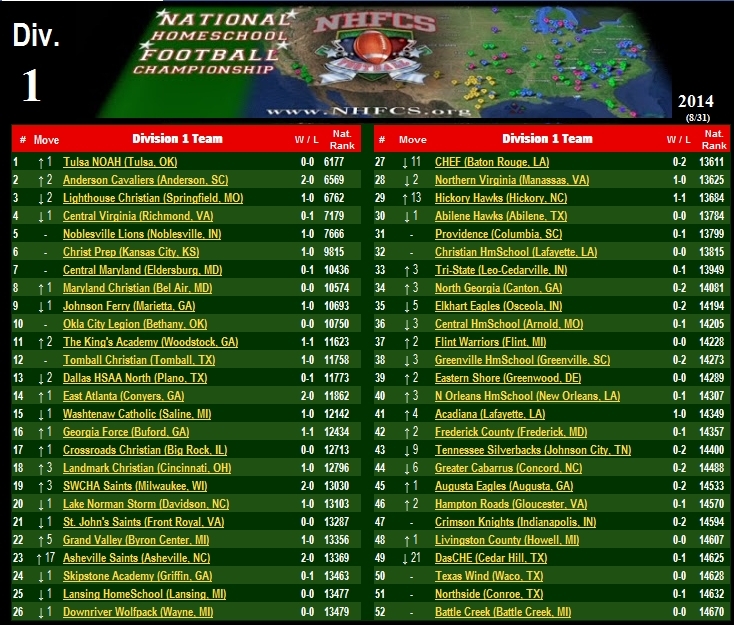 We will soon reveal the debut rankings of Divisions 2 & 3, as soon as the Freeman scoring computers are confident that the entire nation's schools have had an opportunity to play the required 3 games. Any team who does not report the minimum 3 games will not receive a ranking until they have met the reporting requirements. 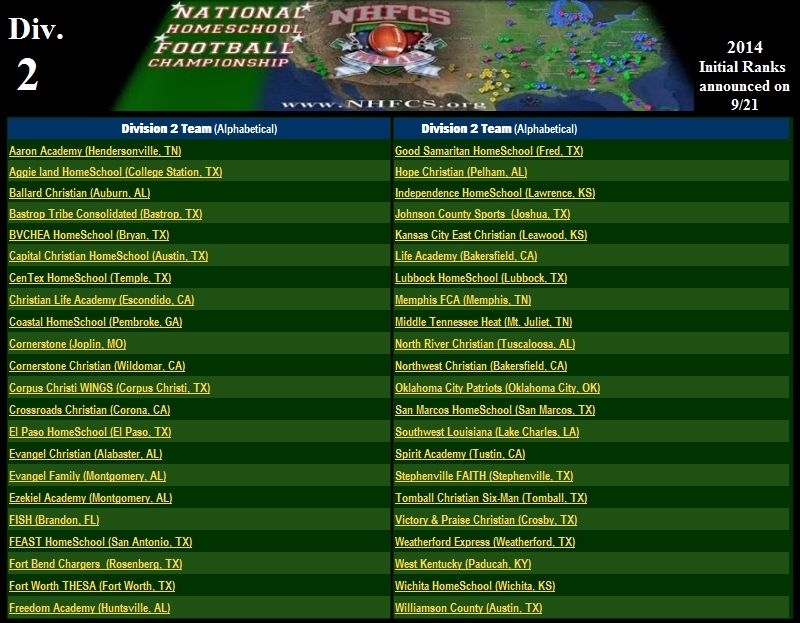 Forfeits, nonvarsity, and inter-divisional play does not factor into rankings. Well, the Rankings have arrived for 2014! 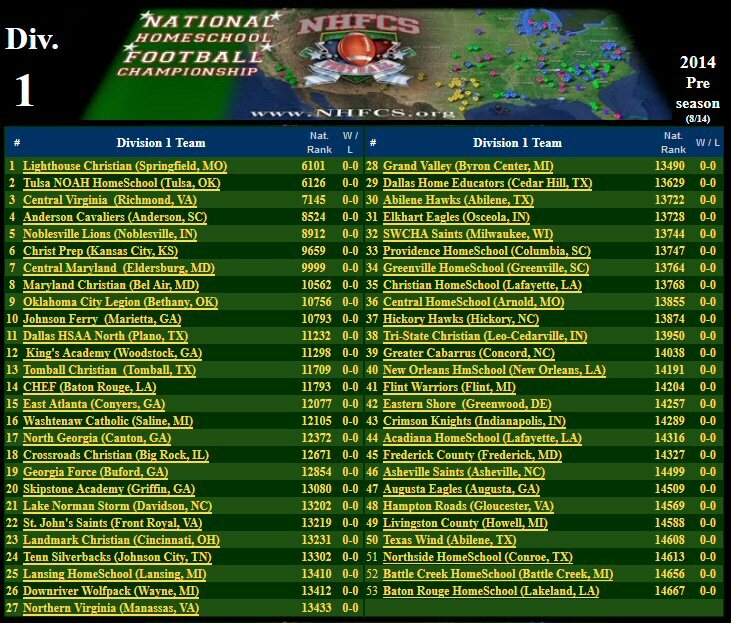 We have well over 140 homeschool football organizations across the United States. 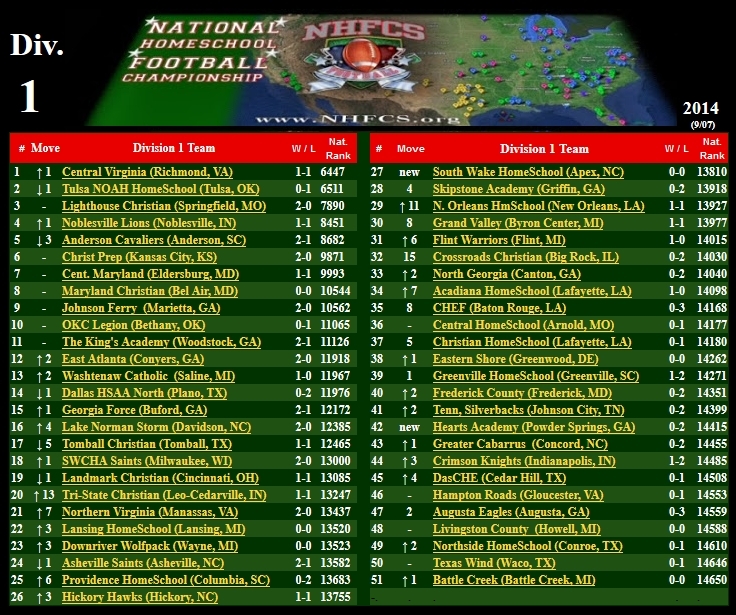 Of the over 70 eleven-man teams, 50 of them are currently registered and published on Maxpreps Rankings service. 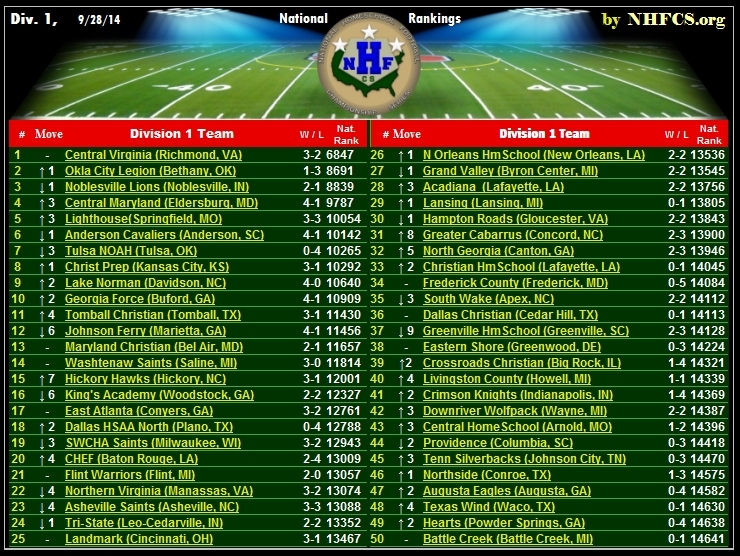 The preseason rankings are devised by the Freeman Scoring services. They are computer-driven and based upon objective criteria. The team's previous year's performance only accounts for a portion of the final rating. Each coach was asked to provide a few other factors, such as returning starters and other details. Any team who has not provided this info may have an inaccurate initial rating. New teams have a very limited capacity to enhance their preseason ranking. If your team has not submitted the preview survey to Freeman's Scoring service, that deadline has passed. The top 5 teams on the chart represent all four regions. The West Region scores very high in this chart, holding the top 2 and 4 of the top 10 positions. The East Region is next with 3 of the top 10. The South holds 2, and the North has one solid team in 5th place. There are many new conferences and realignments in 2014. Several Carolina teams have developed the Carolina Athletic Conference with 2 conference divisions reflecting the north and south portions of the Carolinas. The Great Lakes area has developed the Midwest Homeschool Football Association with a postseason regional tournament. Texas continues it's radical growth. Where there was only 1 eleven-man team just 2 years ago, there are now 8 homeschool groups organizing. Several six-man teams are transitioning to eleven-man. Where homeschool teams flourished in the private schools' TCAL conference, many of them have moved over to the new TAIAO conference which will also included some charter schools. There is talk of finally developing an eleven-man South Central Conference. Some coaches are working to establish a 2-division format with some Texas teams representing the south division while some Oklahoma, Missouri, and Kansas teams forming a north division. A conference championship would pit the 2 division leaders in a post-season bowl game.